Celebrations all round as New South Wales win the State of Origin series in Sydney. JARRYD Hayne was speechless at fulltime after his Blues team ran out 6-4 winners after a Game II epic at ANZ Stadium last night, snapping Queensland's unprecedented eight-series streak. And it wasn't just because of his amazing match, including a memorable try-saving tackle on Queensland second-rower Sam Thaiday, knocking the ball out of the Broncos big man's hands while he was over the line in the 52nd minute. It was because Hayne is one of the most experienced Blues players, and he has been a near mainstay in the NSW team during Queensland's eight-year dominance, enduring year after year of Maroon dominance. 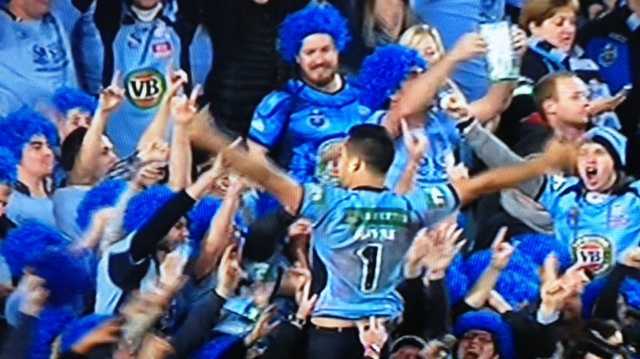 That dominance is now over, and Hayne, such a crucial member in the Blues' win last night, is a deserved Origin champion. The game was won in the 71st minute when Blues halfback Trent Hodkinson showed the ball and ran to score, much like champion Queensland five-eighth has done to his southern opponents over the years. But Maroons fans have every right to feel aggrieved after the subsequent kick-off clearly hit the chest of NSW prop Aaron before flying over the dead-ball line. Woods went to let the ball go in an attempt to get a 50m penalty. He got his wish, but unbelievably that play was not reviewed by the referees. Earlier, it was a step back in time for the first half of Origin II at ANZ Stadium, with the Maroons holding a 4-0 lead going into the dressing sheds. The game could have erupted on a number of occasions, starting with a high shot by Blues skipper Paul Gallen on Greg Inglis in the 10th minute. Blues back-rower and firebrand Beau Scott then engaged in some push and shove with his opposite, Aidan Guerra. Frustrated Maroons skipper Cameron Smith then had some words to referee Shane Hayne when, with him and Johnathan Thurston at marker defence, Thurston was penalised for a facial slap. 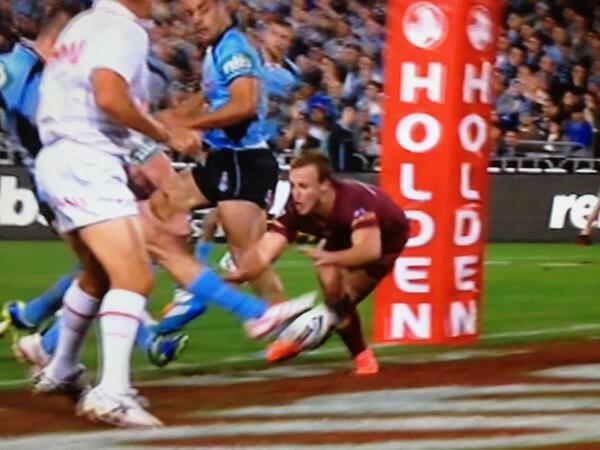 But the Maroons kept their composure, with Blues "Bruise Brother" Greg Bird penalised for not rolling away in a tackle. Thurston subsequently put his team up 2-0 with a penalty goal in the 14th minute. Thurston's next penalty goal in the 30th minute was an historic one, passing Mal Meninga's record of 161 points in the Origin arena, with his 162nd interstate point. Daly Cherry-Evans almost scored a try at the 40th minute but was thwarted by a miracle boot - that of Blues five-eighth Josh Reynolds who beat him to the ball by a matter of inches. That play, and Hayne's incredible last-ditch effort on Thaiday, ultimately won the Blues the game, and their long-awaited series. YOU COULD hear the excitement in Jason Hetherington's voice after the Maroons put in an impressive performance at their final training run in Sydney. "I love this time. Origin time is such a special time," said Mal Meninga's right-hand man after watching yesterday's captain's run. Hetherington, the Queensland assistant coach, was quick to report halfback Daly Cherry-Evans, who had been under an injury cloud, had done enough to prove his fitness for tonight's must-win Origin game at ANZ Stadium. His good fortune spelt disappointment for Dingo's Ben Hunt. The Brisbane Broncos' in-form halfback looked set to make his Origin debut if Cherry-Evans was ruled out. It it is likely he will now be named 18th man. Hetherington, who coaches the CQ Capras, proudly hailed the region's strong representation in the Maroons team, which is chasing nine straight series victories. 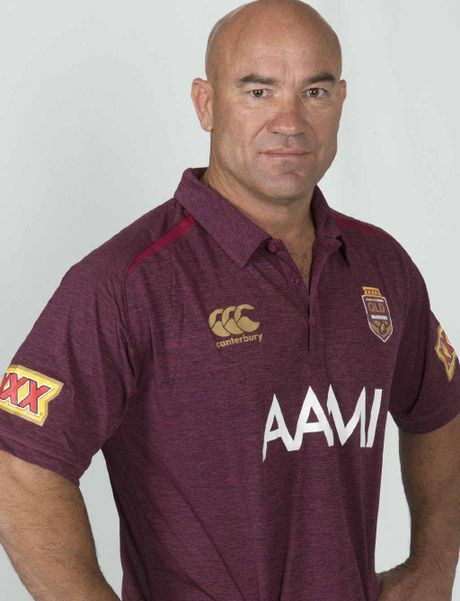 He is expecting local products Cherry- Evans, Matt Scott and Dave Taylor to play an integral role in Queensland's must-win game at Sydney's ANZ Stadium. Hetherington said the team was feeling confident going into Origin 2; the experience of coach Meninga and a strong core in the player personnel proving a steadying influence. The team had enjoyed a relaxed build-up at Camp Maroon at Sanctuary Cove before flying into Sydney on Sunday. "With Mal, you're looking at 25 years of Origin experience as a player and coach. If he doesn't know how to prepare for a game like this, no one does," he said. "He knows how to keep the guys relaxed and when to up the tempo." Hetherington said that close-fought matches were won in the forwards and he was sure the Maroons' forwards would "stand up and lay the foundations". "Cameron Smith has never had a quiet game ... his standards and playing ability are incredible. "(Matt) Scott is in great form and (Sam) Thaiday comes back in, he's an Origin specialist. "We've also got a lot of speed in our forwards. (Matt) Gillett has consistently been one of the best in the NRL and he will have a big game as well." Hetherington said that five-eighth Johnathan Thurston would play more of a "controlling role" with Cherry-Evans starting the match. Betting agency Sportsbet last night had the Blues as $1.65 favourites, the Maroons at $2.30.